"Baste, and then machine-stitch, the shoulder seam, placing about 1/4" (6mm) ease in the lining at the shoulder." I don't understand where this ease should go or what its purpose is. Can anybody clarify? Back shoulder usually is longer than front ( ease here being a dart in a different form) so i would imagine that is what is meant. Lining doesnt ease as well as wool for instance, so basting first makes sense. Edited by Terri, 07 September 2018 - 10:37 PM. A quarter inch isn't much. Across the shoulder it would scarcely show, if at all. Most of the ease would be at the mid shoulder because the shoulder blade is further down and a little more ease helps there. This is such a small amount, even that doesn't matter. It was kind of surprising to see fuse in his book. So the ease is supposed to be placed along the shoulder seam, in the back lining? Usually the outer back is also made of lining material. I´m pretty sure the text wants you to ease in the outer and the inner back piece. The extra length in the back shoulder line is pretty standard operating procedure, and the extra length woukd be on both layers, whether the back is made of two layers of lining fabric or a fashion fabric and a lining. I will check my copy of the book later and see what he says. Edited by Terri, 08 September 2018 - 11:27 PM. Yes, that´s how I do it also. I would be surprised if the book wants something different. Sewing the shoulder seam is different from the armhole seam. My books are in storage at present. Edited by greger, 09 September 2018 - 11:34 AM. So I had a look at my copy of the book and those instruction. For the back of the waistcoat he advocates using coloured lining as the outside of the back and a white lining on the inside to prevent any colour transfer from sweating. He gives construction instructions that are specific to his methodology but does not give a vest pattern in the book, so to use his instructions as written you need to know how he makes his patterns and cuts his fabrics, in order to make his instructions work. 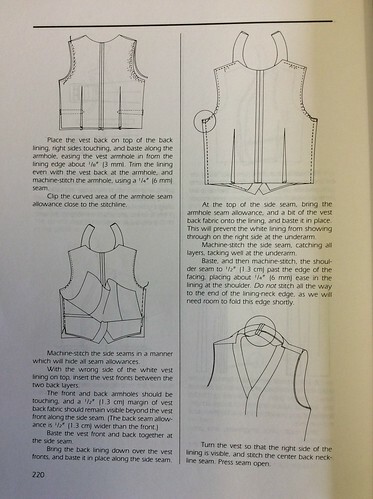 Your vest pattern may or may not have the ease allowed in the back shoulder, so check it. You must measure the front shoulder finished length and apply that length plus 1/4” ease to the back shoulder of your pattern. At the side seam, he has you baste the side seam at first only catching the fronts to the coloured back piece, then at the top of the sideseam at the armhole, he tells you to roll the seam allowance and a bit of the front coloured lining over the edge of the front armhole area so that when you finally sew the side seams and turn everything right way out, that white lining is rolled to the inside slightly, and will not show. Yes it makes a lot more sense if you know what you are doing. That's interesting - the instructions for the side seam have been changed a bit in the second edition. In my copy, he doesn't say to baste the front to the outer back first. That's a good idea that I'll incorporate next time. The bit about folding over the SA and bringing a bit of the back onto the lining was already clear to me, I was just using that as an example of how the text distinguishes between the outer back and the lining, even though they're both made of lining fabric. I'll need to go over my draft again and see if there's any allowance for ease in the back shoulder. Thanks for your help, it's much clearer to me now. Edited by Dunc, 10 September 2018 - 05:22 AM. Make the front a little less in width at shoulder. The width across the shoulder isn't that important. The place to change is at the outer shoulder, unless you have a better fit with a more crooked cut. Checking over the draft, I see that there is a 1/4" difference between the front and back shoulder length, which makes a lot more sense to me now. Thanks again.